NPM stands for Node Package Manager. Sounds weird, since we are not developing a Node.js application here, but we need NPM to use Bower and Grunt. Maybe it’s a stupid comparison, but I’ll try to establish parallels with Java Maven build, to help people like me that are used to Maven to better understand what’s going on. The pre-built installer of Node.js is all you need to have NPM up and running on your machine, but I actually followed this post to install NPM using Homebrew on OS X. In this file, you can find the node settings for your project. The most interesting stuff here is the devDependencies definition. Here you can find the Grunt task to download the project dependencies (grunt-bower-install-simple) and the task to inject the scripts and css in the index.html (grunt-wiredep). This is similar to the plugins definitions in a Maven pom.xml file. Running npm install should download everything you need to start using Grunt and the project tasks. * Time how long grunt tasks take to run, this might be important when having complex builds that take forever. * For now just to show how fancy grunt is. // init required configurations for each task. // From grunt-bower-install-simple. Downloads the web dependencies. // From grunt-contrib-htmlmin. Minifies index.html file. For this file, we are just adding configurations to each Grunt task. We can also assemble all the tasks together to run in our own defined task named build or default. This is like defining our own Maven build lifecycle (which is not possible in Maven) and configuring the plugins settings. So, we actually have plugins (tasks) definitions in one file (package.json) and plugins (tasks) settings in a separate file (Gruntfile.js). The <!-- bower:css --> marks the location in the html file where the css files dependencies must be inserted and <!-- build:css css/third-party.css --> is used to indicate the merged file with all the css code. 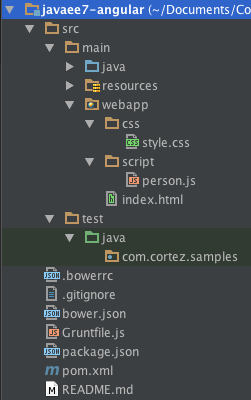 For <!-- bower:js --> and <!-- build:js lib/third-party.js --> it works the some way. Note that we have separated the external files from the own application files. A node_modules folder is created with all of the Bower and Grunt dependencies. A src/main/webapp/lib/bower folder is created with all of the web application dependencies (Angular, jQuery, ng-grid and UI Bootstrap). A build folder is generated with an optimised version of the web application (files concatenated and minified). grunt bower – Downloads the web application dependencies. grunt bowerInstall – Modifies and inject the required files in your index.html. In the meanwhile I have merged this code with the original example. Please, download the original source of this post from the release 2.0. You can also clone the repo, and checkout the tag from release 2.0 with the following command: git checkout 2.0. Probably it could also be easier to use Yeoman to generate the structure, but we also wanted to learn more about the individuals tools, and I think you learn a bit more by doing things manually the first couple of times.